I am so honored that Quilter’s World has published another purse design, of mine, for their “In The Bag” series in the April 2011 Issue. The purse is called the All ‘Round Tote and features a military uniform as the bag body and a fabulous large circle as the bag base. Complete with grommets, a scarf handle and semi-circle accents! It really is a very easy bag to make, either with uniform fabrics or with traditional cottons. The bag is big enough to hold a couple towels for the pool, a few skeins of yarn for soccer practice, or a couple items to take on an over-night trip. (above) That’s a screen shot from the Take A Peek Inside feature on the e-Pattern Central website. The bag in the magazine is made using an ARMY uniform + Kate Spain’s Fandango line of quilter’s cottons, by Moda. The picture below shows green BDU camouflage + Sandi Henderson’s beautiful orange fabric, by Michael Miller. 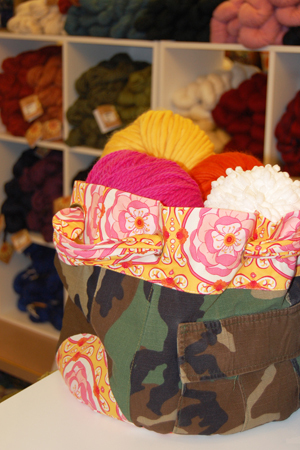 Note: This picture was snapped at TWIST– the Yarn Store (that is such an understatement, they have every yarn-ish, roving-ish, knitting needle known to woman kind down there!!!)? So, the Yarn Store down in the Historic Delano District- Wichita KS. 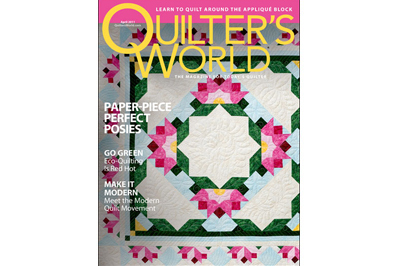 Check out the newest issue of Quilter’s World! Do you get tired of hearing congrats all the time? Well, here goes again!!!! It looks beautiful. We have quite a neat yarn store out here too, kind of out in the middle of nowhere (Gove, Kansas). Looks great! Congratulations on your feature!